MOVING from the starched and polished world of private equity to the rough-and-tumble one of the offshore and marine business was as much of an eye-opener for Vallianz Holdings chief executive Ling Yong Wah as was his first time on one of his own boats not too long ago. When he stepped foot on an anchor handling tug, a type of offshore support vessel (OSV) that is commonly used to handle anchors for offshore oil rigs, he found that it was "cramped, confined, with very tough working conditions", he recalls. It was starkly different from the 13 to 14 years he had spent in private equity, which had been "very transaction-based ... we were just there to do a deal". Before that, he was in corporate finance. The initial surprise notwithstanding, he took to the environment in Vallianz immediately. "I told my ex-colleagues that I'd never realised the finance industry was so superficial," he quips. "The mindset (at Vallianz) was very operational, people were very dedicated to their jobs. It's so different, you can feel their commitment and enthusiasm." 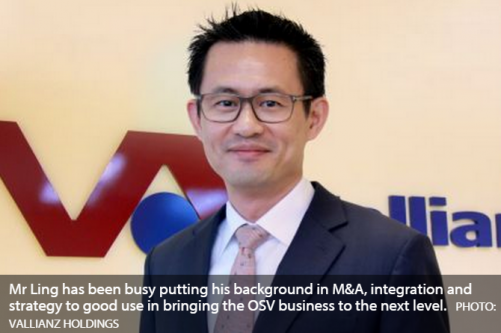 Mr Ling, who was first appointed an executive director at Vallianz in March 2014 and then CEO in January this year, has been busy putting his extensive background in M&A, integration and strategy to good use in steering the OSV business to the next level. Catalist-listed Vallianz, which used to be a unit of mainboard-listed offshore engineering firm Swiber Holdings before it was injected into a listed shell in 2010, may look small with its market cap of around S$167 million but it is actually among the top two vessel suppliers to the biggest energy firm in the world. Mr Ling declines to reveal the name of Vallianz's main customer, but it is known to be Saudi Arabia's state oil company Saudi Aramco. The firm is also doing business with national oil companies in Qatar and Abu Dhabi. And although Vallianz has drawn attention recently due to having one of the highest net gearing ratios among local listed offshore players right now, he says that banks remain confident when lending to it because of its secure long-term charter contracts and it is in no danger of breaching covenants. Its net gearing was 2.09 times and total debt was US$528.5 million as at March 31. Nonetheless, he adds that the company is aware of how the market perceives its debt levels and is "actively trying to bring it down", though he is quick to point out that the company is "still fast growing" and will therefore have to "continue to lever up". The typical loan-to-value for an OSV is around 70-80 per cent. Most of Vallianz's revenue right now comes from its 50:50 joint venture with Saudi Arabian conglomerate Rawabi Holding, and the plan for the company going forward is to "cement that leadership position" in the Middle East while diversifying, Mr Ling says. One factor it has going for it is its relatively young fleet of about 40 OSVs, which has an average age of about three years. It has also recently done some acquisitions and fund-raising as part of a broad strategy to strengthen its stronghold in the Middle East and grow its footprint in places such as Mexico and Indonesia. The integration of a few companies it acquired in 2014 will help it save costs, Mr Ling says. One acquisition was a shipyard facility in Batam that the company can use as a marine base - effectively a "carpark" for boats - and another was a manpower resource company that the company can use to find contract workers to crew its vessels. Its ability to innovate to meet specific customer needs also gives it an edge, Mr Ling says. The company spent about nine months developing a custom offshore floating storage and supply vessel (OFSSV) for its major customer in Saudi Arabia. The idea for this vessel came about because that customer "wanted to see how they could rationalise operations and improve their cost structure", Mr Ling says. The specialised vessel, which can be thought of as a "compartmentalised tanker with production capabilities on the vessel itself", is still being converted from a tanker and is expected to begin service in the early part of Q4 this year, he says. The development of the special boat has also helped to deepen the relationship with its Saudi customer's senior management. The company is hoping to tap its strong track record to clinch more charter contracts in Mexico, where Mr Ling expects a lot more projects in the next few months as the country deregulates its energy industry. Vallianz already has an entity in Mexico and is hoping to lock in a charter contract with the country's national oil company Pemex. That "will give us another leg to stand on ... at first we plan to charter out existing vessels, but eventually we want to move towards what we have with our Saudi customer, which is specialised boats". Vallianz's existing charter contracts were inked before the oil slump and Mr Ling says it has not been pressured to lower rates yet, with the next contract renewal coming up in 2017. But the firm is taking proactive steps to consolidate operations and lower costs. In the long run, he remains optimistic about the offshore industry's prospects. "There will never be a replacement for oil. Freight, passenger, military aircraft and vehicles - all of them use oil. It's always going to be there."